I took one of my classes on a field trip today. We went west of town to the Old Smyrna Church and Cemetery. Smyrna Methodist Church on Highway 36 and Jaybird Lane is the oldest church building in Arkansas. 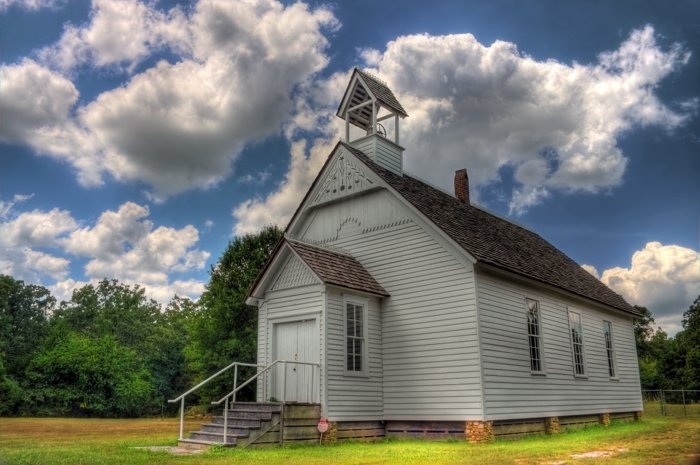 After studying the wood that was used to build the church, the historians determined that it was built in 1857 and some of the trees that were used to build the church began growing in the early 1600s. We also visited the cemetery. Many of the headstones are so old that I could barely read what was written on them. Some of them are more modern. It was a gorgeous afternoon to be outside. The students collected information from headstones (shapes, dates and epitaphs) and we will analyze it and draw some conclusions next week. It is a cross-curricular study at its best. We will be able to study math, art, literature, science, and history all from the same experience. On a deeper level, I think it is good for us to think about death as a part of life. Our culture seems to acknowledge death as little as possible. I felt a connection with the people that were buried there and had lived their lives in that community. The cemetery represents so much loss and sadness but it also represents life. Some of the people had long lives and had lived into their 90s. Some were short and had lived only a day. But each one matters. Every one of those people matter.